Willy Fautré is the director of Human Rights Without Frontiers. On 6 January, in Istanbul, Ecumenical Patriarch Bartholomew handed the official decree of autocephaly (independence from Moscow) to the head of the new Orthodox Church of Ukraine (OCU), Metropolitan Epifaniy (Dumenko). On 15 December, the election of Epifaniy as Metropolitan by the unification council finalised the merge of the Ukrainian Orthodox Church (Kyiv Patriarchate) and the Ukrainian Autocephalous Orthodox Church (UAOC) under the name of the Orthodox Church of Ukraine (OCU). The Ukrainian Orthodox Church that is in communion with the Moscow Patriarchate refused to participate in this process because of a longstanding dispute over legitimacy. Two months earlier, on 11 October, the Ecumenical Patriarchate of Constantinople had announced he had decided to grant autocephaly to the Ukrainian Orthodox Church (Kyiv Patriarchate) which deemed itself to be the successor of the historical Orthodox Church, created in the aftermath of the conversion and baptism of Prince Vladimir of Kiev in 988, at a time when Moscow did not even exist. 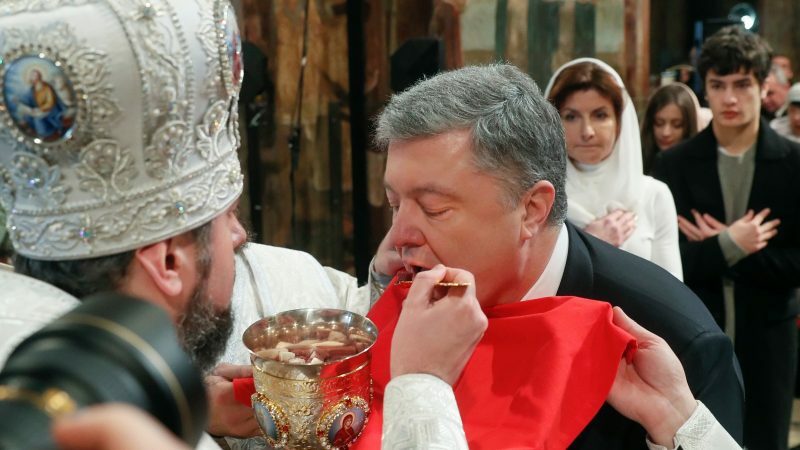 On 14 October, Ukraine’s President Poroshenko declared on television that the autocephaly of Ukrainian Orthodoxy is a question of national security. The date of his public announcement was a symbolic one as it is both a religious day (Intercession of the Mother of God) and an official holiday honouring Ukrainian armed forces. In the meantime, the Synod of the Ecumenical Patriarchate had invalidated its decree transferring the jurisdiction of the Kyiv Metropolis from Constantinople to Moscow in 1686. It had also lifted Moscow’s disciplinary measures against the heads of the two Orthodox Churches which had respectively broken away from Moscow Patriarchate’s ecclesiastical jurisdiction in the early 1990s: Patriarch Filaret (Denysenko) of the Ukrainian Orthodox Church (Kyiv Patriarchate), excommunicated by Moscow in 1997, and Metropolitan Makary (Maletych) of the Ukrainian Autocephalous Orthodox Church (UAOC). In immediate response to the autocephaly initiated by Constantinople and in retaliation, the Synod of the Moscow Patriarchate immediately declared the full severance of relations with the Ecumenical Patriarchate. On 20 December, 240 Ukrainian parliamentarians approved Bill No 5309 obliging the Ukrainian Orthodox Church (in unity with the Moscow Patriarchate) to indicate in its official name that it is part of the Russian Orthodox Church, which has its seat in Moscow. The bill provides for specific limitations of the activities of religious organizations under the jurisdiction of a religious centre based in “an aggressor country”, which is the case of Russia in the eyes of Kyiv. The first set of restrictions concerns the access to military units for their clergy and chaplains and more can be expected. Moscow’s break from Constantinople is now consummated. After its territorial and political independence, Ukraine is now on the way of conquering its spiritual independence. Noteworthy is that the Orthodox Church in Poland, an EU member state, has decided not to recognize the OCU’s autocephaly. The same negative position was also adopted by the Orthodox Church of Serbia, a European state engaged in a process of accession to EU membership. Other Orthodox Churches in the Balkans and the EU, which are under the ecclesiastical jurisdiction of the Russian Orthodox Church, are keeping a low profile and are, for various reasons, obviously reluctant to recognise the OCU’s autocephaly. As for the Orthodox Church of Georgia and the newly elected president, they have not taken a position yet about Ukraine’s autocephaly, out of fear that the Russian Orthodox Church would recognise the Abkhaz Orthodox Church’s independence, which would negatively impact efforts to restore Georgia’s integrity. No doubt that, after losing Ukraine, Moscow Patriarchate will use all its power in Europe, with the support of the Kremlin, to avoid any recognition of Ukraine’s autocephaly by its sister churches. Kyiv is trying to mix church and state: always a bad idea.